In 1957, Alfred W. Fielding and Marc Chavannes set out to make a new type of wallpaper. Instead, they changed the world of packaging. They were attempting to develop an easy to install and clean wallpaper with a paper backing. The partners sealed two shower curtains together creating a cluster of small bubbles between the two layers. 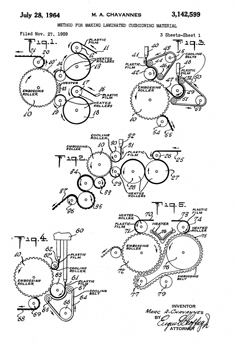 For this invention, they received U.S. Patent No. 3,142,599 on July 28, 1964 for a Method for Making Laminated Cushioning Material. The product was unsuccessful as wallpaper. Looking for other ways to use the plastic, the duo even tried to sell it as greenhouse insulation. The use of the air cushioned material as protective packaging was discovered later. Chavannes had the inspiration to sell the invention as a shipping material on a plane ride into the Newark, New Jersey airport. The legend goes that when it descended into the clouds, the plane seemed to be cushioned by the air. Chavannes had his great idea and Bubble Wrap was born. The Sealed Air Corporation was started to market the product for packing. Bubble Wrap’s first customer to buy the packing material was IBM. The company used the Bubble Wrap for protection of the IBM 1401 computer during shipping. Bubble Wrap has been a hugely successful material. Today, the Sealed Air Corporation produces various protective packing materials and has yearly sales of over 3 billion dollars. The fun of popping the bubbles have made the product a part of pop culture. 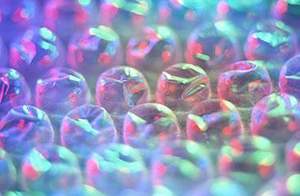 Bubble Wrap commemorated its 50th anniversary in 2010 with its own day, Bubble Wrap Appreciation Day. Websites and games celebrate all things Bubble Wrap. There are Bubble Wrap Fashion shows, invention competitions and even a book dedicated to the product. ← Invention Geek – Chester Greenwood?